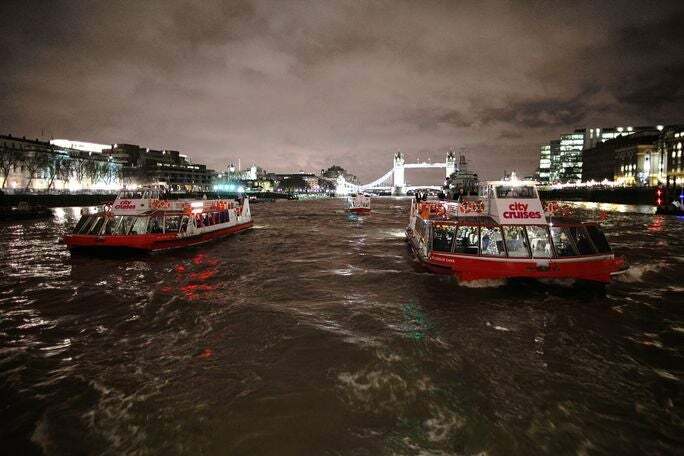 Take to the waters for one of London’s best night’s out! The London Showboat cruise combines three of our favourite things - eating, drinking and dancing! A four course meal is served as the wine flows and our artists perform show tunes and top hits. All whilst the sights of London glide past in majestic fashion, with no crowds and from a totally new vantage point. There’s no better way to enjoy London by night. As the London Showboat cruise leaves dock, the music starts and the four course meal is served. The three and a half hour cruise lets you take in all of London’s major attractions and iconic architecture, all the way down to the Thames Barrier - arriving just in time for dessert and coffee. And then it’s up to the dance floor as we make our return journey. You couldn’t ask for a better evening’s entertainment. Don’t miss the boat - come join the fun! Customers are recommended to arrive 15 minutes before their departure time and exchange their voucher to be able to board the vessel. The boat departs Westminster Pier daily at 19:45. Boarding commences at boarding point 2 from 19:30. The boat returns to Westminster Pier at 23:00. For any special dietary requirements please call reservations. We have maximum two spaces per boat available. We ask you to contact the reservations team to discuss which boat is the best for you. The London ShowBoat Dinner Cruise, is an Adult orientated experience and may not be suitable for young children. City Cruises does allow a limited number of children under 18 provided the children are dining with a responsible adult. Children are charged at the full adult rate.